I have written about my hospitalist PQRS (formerly PQRI) experiences since 2007. I am a hospitalist with over 10 years experience and I have been 100% successful with this program on a year-over-year basis since its inception. You can find all my experiences here in my continually updated blog post describing my experiences and my thoughts about this government physician quality reporting program. I will also be providing updated resource links for PQRS as they become available over time. UPDATE March, 2014: Here is an article from The Hospitalist with new CMS options (link no longer active) for PQRS reporting. 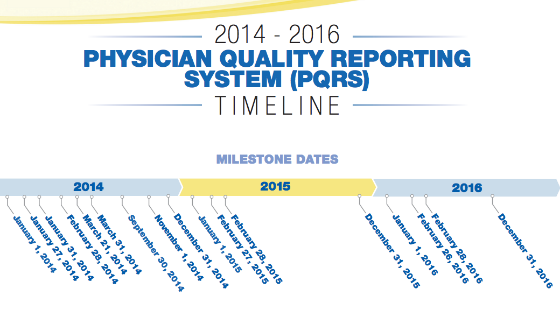 UPDATE February, 2014: CMS has released this fantastic PQRS interactive timeline to help providers plan for the PQRS future. Click on the image to go to the interactive pdf file. UPDATE November, 2013: CMS has provided this resource fact sheet to help with PQRS compliance. UPDATE 2012: It's November 15th, 2012. Are you a hospitalist wondering if you qualified for your PQRS (formerly known as PQRI) payments for 2012? If you're wondering whether or not you are going to get your bonus for 1% of all Medicare charges between January 1st, 2011 and December 31st, 2011, the decision has already been made. I have been informed that I will receive bonus for my diligent PQRS efforts. This complicated voluntary program has been a thorn in many physicians' sides. Many doctors find qualifying to be complex, confusing, time consuming, labor intensive and probably more expensive than the bonus payment is worth. Last year my hospitalist group had only 2 out of nearly 20 doctors qualify for the PQRS bonus. I was one of the successful physicians. This year over 50% of hospitalists in my group qualified for their 1% Medicare bonus. That's a significant improvement for which I have no explanation. Yet still, it represents only 50% of our physicians. I have blogged extensively about my experiences with PQRS/PQRI in the past and the difficulties of my member physicians have had getting qualified for their PQRS/PQRI bonus payment. I have a perfect five year track record of qualifying for my efforts because I understand how this complicated process works. It's a game who's relevance borders on absurd. One need only to take a look at this snap shot picture below of our most up-to-date daily rounding sheet for what is required of me to submit on every patient I see in order to qualify for my performance bonus. 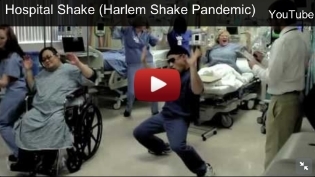 This is what practicing medicine has become. Even these daily billing cards must be updated on a yearly basis to stay in compliance with the ever changing rules. You can read about my previous experiences below. PQRS/PQRI is yet one more example of how government bureaucracy has turned the physician-patient experience into one of declining relevance as third parties demand compliance with increasingly complex and tangential requirements before they will pay physicians. Physicians who have qualified yearly for their PQRS/PQRI efforts have received an annual CMS bonus based on a percentage of their total Medicare charges for the calendar year preceding the year of payment. That bonus is determined by law. What is the history of percent of Medicare charges for this bonus? Here is the list of PQRI percentage payments through the years from the CMS website from 2007-2015 and beyond. These percentages are based on allowable Medicare charges. Starting in 2015 physicians who do not voluntarily participate in PQRI (now known as PQRS) or who do not qualify based on their complicated rules of engagement will be penalized 1.5% of their Medicare charges. But hold on to your chairs doctors. That penalty will be based on 2013 charges and data. That means if you haven't learned to master PQRS/PQRI by January 1st, 2013, you had better learn quickly. As a hospitalist group, after a review of all potential reporting initiatives, the three quality improvement codes we have chosen as a group (and shown in my pictures above) appear to be the only appropriate measures for hospitalist medicine that can be satisfied with any reasonable assurance of success. 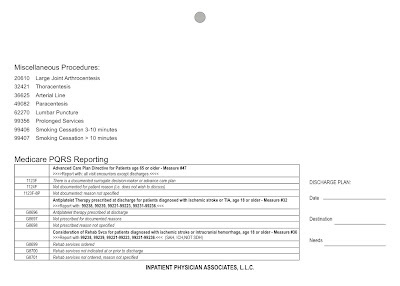 There simply aren't enough measures that we can comply with for the group reporting method, therefore we continue to submit PQRS individually as physicians. In addition, instead of the 80% reporting threshold, I have heard this requirement has been dropped to 50% to increase compliance and success in 2013. Remember, 2013 will be the year used to determine 2015 PQRS penalties. From the lesser of two evils, that rule change is encouraging. After 2015, that penalty goes up from 1.5% of Medicare charges to 2% of Medicare charges. If you aren't planning on participating on PQRS then plan your practice management budget accordingly. CMS, as part of PQRS, is giving bonuses to physicians who participate in MOC. PQRS is a federal quality reporting program that enables physicians to earn an incentive payment equal to 0.5% of their total Medicare Part B Physician Fee Schedule (PFS) allowed charges for covered professional services. Physicians can earn the quality reporting bonus by satisfactorily submitting information to CMS on a designated set of quality measures. Detailed information on PQRS is available on the CMS website. How does PQRS MOC work? In addition to submitting PQRS quality measures to CMS, physicians can also participate in ABIM's PQRS MOC program, which is an additional, voluntary program that enables physicians who are certified by ABIM and who successfully report PQRS quality measures to CMS to earn an additional 0.5% bonus by also participating in ABIM's MOC program more frequently than is required. Medical Knowledge: This requirement can be met by completing an ABIM medical knowledge module or a third-party module approved by ABIM. Practice Performance: This requirement can be met by completing one of the ABIM PIMs Practice Improvement Modules® or one of the ABIM Approved Quality Improvement (AQI) pathway programs of other organizations. Patient Survey: Many ABIM PIMs already include a patient survey. Physicians can also meet this requirement through the survey tool provided on the ABMS MOC Matters portal. MOC Matters, a Web-based portal created to help physicians enroll in the PQRS MOC Program Incentive and report their MOC activity, is available now. The portal features tools that allow physicians to participate in PQRS MOC Incentive Program as well as complete the PQRS requirements. Additional information on ABIM's PQRS MOC Incentive Program requirements can be found here. Questions? Call 1-800-441-ABIM (2246), Mon. – Fri., 8:30 a.m. to 8 p.m. ET, Sat. 9 a.m. to 12 p.m. ET, or send us an e-mail. UPDATE 2011: As of December 7th, 2011, PQRI (PQRS) payments have been disbursed. If you haven't received your check yet, you probably aren't going to by now. PQRI/PQRS is another bloated government program trying to reward physicians for quality care as defined by CMS. Physicians report on defined ICD codes linked to defined CPT codes linked to defined PQRI, now known as PQRS codes. In order to get paid my bonus (2% of allowed charges for 2010) from the CMS, I had to report to CMS on at least 80% of qualified patients I see with regards to specific and defined quality parameters. I have dozens to choose from. Here is the list that keeps on growing. I have to meet an 80% reporting threshold on at least three criteria or I don't get any of my two percent bonus money at all. PQRS is an all or none effort. For a doctor to qualify for their CMS PQRI/PQRS bonus, they would have had to meet an 80% reporting threshold for at least three chosen quality measures of their choice. We decided, as a group, to report on the following three quality measures below. There were dozens to choose from. We chose these three and continued to use these three measures into the 2012 reporting season and beyond. Not only do we have to report on at least 80% of qualified patients on all three quality measures, but we also must know which CPT codes these measures apply to. You see, measure #47 applies to all possible E&M codes, except discharges. While measures #32 and #36 only apply to all inpatient discharges (99238, 99239), inpatient admissions (99221-99223), inpatient follow up codes (99231-99233), or same day admit discharge codes (99234-99236). Even more complicated, before Medicare got rid of consults, quality measures # 32 and 36 only applied to discharges and consults, but not admissions. But it gets even more complicated. 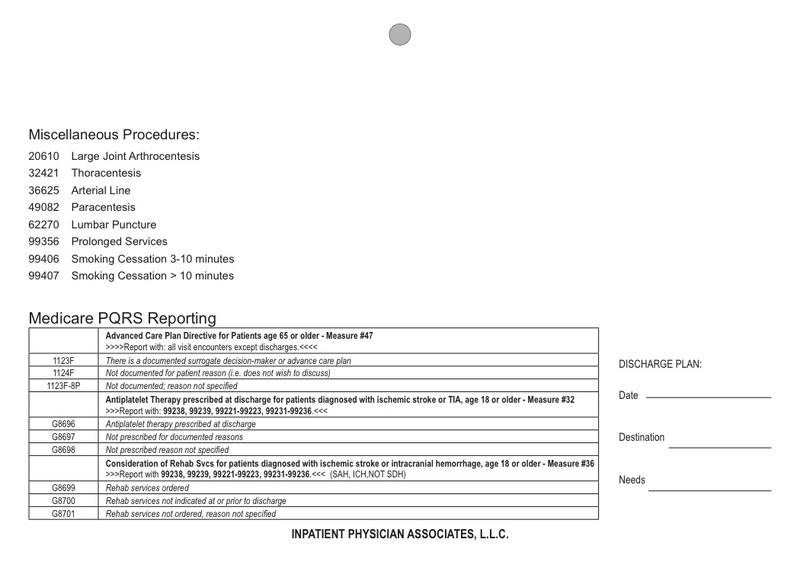 Not only do certain quality measure only apply to certain CPT codes, but only specific ICD codes apply too. For example, for quality measure #32, ICD codes 4234.91 (stroke) and 435.9 (TIA) apply, but for quality measure #32, only 343.91 (stroke) and 431 (bleed) count. If you don't get the right ICD code with the right CPT code to match with a quality measure code, and do it at least 80% of the time for all three reported quality measures, you get no bonus at all. How did my hospitalist group come out this year in their PQRI/PQRS reporting. Once again, only two doctors out of almost 20 succeeded in qualifying for their bonus payment. Myself and one other physician. Again. I have never missed being successful since the inception of the program. It's because I know how this complicated process works. And how much did I get paid for my 2010 efforts? I got paid about $3,000, before taxes, in September, 2011. All that paper work and all that manpower by the billing company to submit the data who's economic benefit is probably less than the payout. UPDATE 2010: PQRI for 2010 is in. I'm not even sure what time period this covers. But, if you haven't yet received your money for this physician pay for reporting program, you probably didn't qualify. It's not about performance. It's about reporting. Don't worry though. You aren't alone if you didn't get your cash. Of all the nearly 20 hospitalists in Happy's hospital group who participated in PQRI for 2010, only Happy and one other doctor received their Medicare money. I myself walked away with a $2,800 Medicare payment. All for doing nothing more than, well, pretty much doing nothing. But I do complete this process and have learned it well because I know someday they are going to turn this reward into a penalty. Learn the process. Collect your $2,800 for passing go. I haven't missed my payday yet. But something tells me they'll try and change the rules one of these days. Then it's back to the drawing board to change the plan of attack. UPDATE 2009: It's official. Happy has now earned his CMS physician pay for performance PQRI Bonus based on 2008 data. How much was my PQRI Medicare bonus for calendar year 2008? A $2,500 check written out directly to Happy from CMS. PQRI is the Medicare program for physicians that was initiated by Congressional mandate in the latter half of 2007. PQRI reporting is currently voluntary, but legislation in future years will certainly mandate reductions in payment for not submitting data, all but making this program a punitive standard. Many physicians failed to meet the requirements to get paid under CMS performance program guidelines in the latter half of 2007, the first year for PQRI measures. After discussing concerns with my coding company, I learned why PQRI was a dud for many physicians in 2007 (see below for details). It was the government's own fault. Imagine all the hard work, overhead, time and frustration that must have been encountered simply to get back 1% of their gross Medicare collections. It's no wonder why many doctors won't accept Medicare anymore. You get what you pay for. As a result of the governments misdoings, they did end up paying an additional 3,900 physicians an average of $860 a piece. So who's playing and winning the CMS pay for performance game? It turns out in 2007 less than 1/3 of physicians felt like battling the PQRI requirements. That doesn't surprise me, considering the average PQRI bonus payment for the second half of 2007 was just around $600. In my group alone, I was the only physician of almost twenty that successfully navigated the incredibly complex PQRI reporting rules of 2007. I blogged previously (see below) about my first experience with PQRI and showed you the data card we used in our first attempt to capture all the PQRI data. You can see how complicated this process was. We had reported on four measures instead of the required three in this year to provide a buffer in case we failed reporting requirements on one of the other three. How did the rest of the country do with PQRI for 2008 (link no longer active)? The government paid out 92 million dollars to 85,000 physicians. Another 70,000 physicians tried to play the game and failed. Not one penny received. This represents about a 15% participation rate, with only 7% or so of physicians nationwide succeeding. This represents a pitiful 55% success rate for PQRI in 2008. The average physician received a little over $1,000. The highest paid PQRI physician earned $98000 for their PQRI physician pay for performance efforts. The states with physicians receiving the most PQRI pay for performance money were Florida and Illinois with 7.5 million and 6 million dollars respectively. With a horrible 2008 PQRI experience now behind us, there is hope for my colleagues yet. We made some drastic changes to our methods of collecting the data with the hopes of having universal success for the 2009 PQRI pay for performance. My hope is that Happy's colleagues will finally succeed in winning the game that has generated nothing but annoyance for many physicians. In retrospect, were not successful. UPDATE 2008: As you may or may not know PQRI is the name given to the, as of current, voluntary quality reporting reporting program for physicians. If they successfully complete the goals outlines by CMS, physicians can earn up to a 1.5% additional payment for all Medicare claims. In 2009, that number goes to 2%. So here's how the program works. CMS has a list of over 100 indicators that physicians can chose to report on. Things like checking HgBA1C for diabetics, monitoring blood pressure, assessing fall risk, evaluating for beta blocker use in heart failure. There's a ton of them. But we physicians don't need to report all of them. How many? Just three, but here's the catch. You must report at least 80% of the time on qualified patients on all three of those indicators or you don't get any money. If you meet the qualifications for two of them with 100% and the third indicator is 79%, you get nothing. For the reporting period of July-December 2007 I was the only physician in my group of almost 20 doctors that successfully achieved the 80% mark on three indicators. And with that, I took home a $1,100 bonus, before taxes. $1,100. That's what I had to show for it. So what does it take to qualify? Well, it can be very complicated. So let me break it down for you. Let me pick just one quality indicator that we have been reporting on. Our group picked four out of the hundred or more quality indicators. We picked one extra one to give us some breathing room. Only three of those four must qualify. So let's look at coronary artery disease. The quality indicator was: Is a patient with coronary artery disease being prescribed antiplatelet? For simplicity, antiplatelet will mean aspirin in this discussion. How does one report? Well. It gets very complicated. So here goes. I'll try and explain. There are several aspects to the reporting that must all come together by some sort of stroke of luck from the Heavens for success in the program to be achieved. Which CPT code is the quality indicator good for? This is one of the most important aspects. Just because I saw the patient does not mean I can report to the PQRI system on that patient. Only certain CPT codes qualify. Remember CPT stands for Current Procedural Terminology. Whenever you have any possible billable encounter, your doc must submit the CPT code via the third party insurance rules per their contract. A mid level hospital follow up--> CPT code 99232. A critical care evaluation in the ICU-->99291. Reading an xray? Performing a heart cath? They all have their own CPT codes. 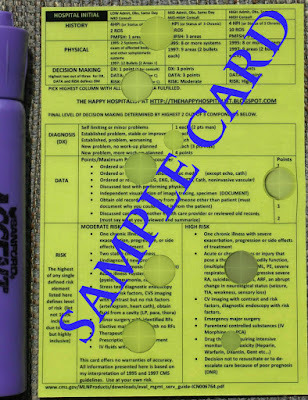 So you have to know which CPT codes your quality indicator is good for. For aspirin use in coronary artery disease, the MNB accepts it for hospital discharge codes, consult codes, outpatient consult codes, among others. You can report to PQRI for all your CPT encounters with this patient, but the MNB will only accept it in the denominator of your numbers if the encounter is one of their approved CPT codes. The rest is just wasted energy. Reporting to PQRI on CPT codes that aren't approved won't get you anything but an increased overhead in time and energy. So you have to get past this step. Let's say, for arguments sake, that I discharge a patient from the hospital, using CPT code 99238. The MNB says this CPT code CAN be used to report aspirin use for CAD to PQRI. The PQRI system does not care how many qualifying patients you report. If you only submit one patient all year for aspirin use in CAD and if you document it appropriately, then you have 1/1 on your report card. You are 100%. You meet the threshold of 80% for that one indicator and you are successful. Remember you need to report three quality indicators. It seems easy, but it's not really. It gets a lot more complicated. Are you linking the ICD code with the qualifying CPT code? The ICD code or International Classification of Disease is the disease. In this case, coronary artery disease (414.0). When ever a doctor submits a CPT code to the insurance company to get paid, that CPT must be linked to an ICD code. This is to protect the insurance company from scrupulous doctors submitting office visits for such things as "talking about the football game". For insurance to pay a doctor for their CPT visit, there must be a linking to a disease. So all disease have their own ICD code. In this case the ICD code for coronary artery diseas is 414.0. Now here's the kicker. If you submit a claim to the MNB to be paid for a 99238 (a hospital discharge code AND an allowable CPT code for PQRI for the the quality indicator for aspirin use in CAD) and you link the CPT code to ICD code 414.0, but you FAIL to report to PQRI, you have just lost a patient on your numerator. For example. Lets say you have 2 patient all year with CAD who you saw and who's CPT code would qualify them for PQRI reporting. Lets say patient one you link ICD code 414.0 (CAD) to your claim to Medicare for CPT code 99238 and you report to PQRI. You have successfully complete 1/1 claims. You are 100% successful on your reporting for that one quality indicator. 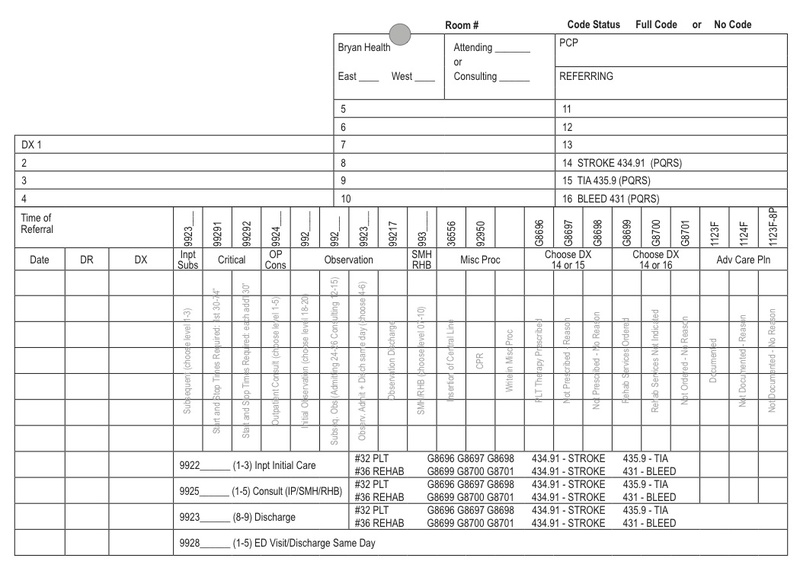 Now, lets say patient number 2 has CAD and you successfully link your ICD for CAD, 414.0, to your CPT code for discharge, 99238, but you FAIL to fill out the appropriate reporting (to be discussed shortly) to PQRI. Your have now increased your denominator to 2, but you have only reported on 1/2 patients. So your successful reporting is only 50%. Remember PQRI requires you to report on 80% of your qualified patients. In this case, because you failed to report to PQRI on just 1 of 2 patients, even though you submitted to the MNB to get paid for your office visits, your 50% does not qualify, and this quality indicator thus fails. Remember, you must pass 80% on at least three different quality indicators to get your 1.5% bonus. So depending on how many different quality indicators you chose to report, you can still make it up on other quality indicators. Another common area to fail in the reporting game is failure to link the ICD, 414.0, to the CPT code 99238 when submitting to PQRI. Many patients we see have 10, 15 or 20 medical problems/ICD codes. When you submit a claim to the MNB, they will only accept 4 ICD codes. 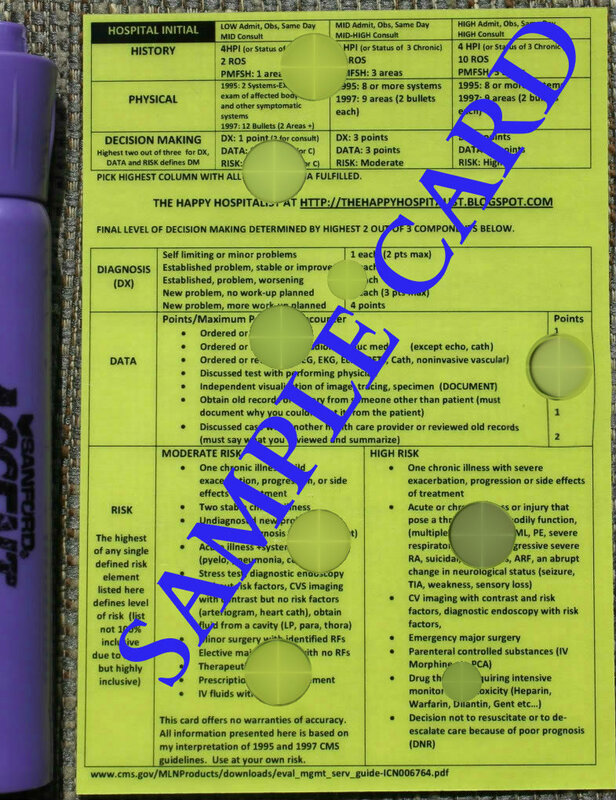 If a patient has pneumonia, hypertension, COPD and diabetes, AND CAD, and you submit your CPT code to the MNB on discharge code 99238 using the ICD codes for pneumonia, hypertension, COPD and diabetes, BUT you fail to include the ICD code for CAD (414.0), then the MNB will not include this patient in your denominator for PQRI reporting. For reporting purposes, it is as if this patient does not exist. Even though they have CAD, since you did not link the ICD for CAD (414.0) to your qualifying CPT code 99238 for quality indicator aspirin use in CAD, this patient will not apply to your denominator for reporting purposes. In the course of a year, this can hurt you because the fewer patients that you qualify, the fewer screw ups you can tolerate and still hit 80%. You see, reporting correctly on 80/100 patients is alot easier than reporting correctly on 1/2. Your margin for error is far greater the more patients you qualify to report on. So failing to link the ICD code to the appropriate qualifying CPT code can only hurt you in the long run. Got It? So here's the summary. CMS puts out a list of a hundred + quality indicators that they believe represents a marker of quality health care. For physicians who wish to participate, they must report data on at least 80% of the patients that qualify (the denominator) for at least THREE indicators. Physicians can report as many indicators as they want, but the minimum is three, and you don't get any extra money for reporting more. Once you've decided which indicators you want to report, it doesn't matter how many patients you have on each indicator. Your denominator could possibly be only one patient. If you successfully report only one of one patient for all three indicators, you have achieved 100% success in the PQRI program, and the MNB will cut you a check in 2008 for 1.5% of ALL your Medicare billings. But it's not that simple. If you have a patient that would qualify in the denominator (appropriate CPT code for the quality indicator) AND has the appropriate ICD code to report (CAD/414.0) but you if you choose not report to PQRI, your denominator increases and your numerator stays the same. This would put you at risk for not meeting the 80% requirement. This is what happened to the vast majority of folks in Happy's Hospitalist group. We all met the required number of patients for each quality indicator. That would be at least one patient, because there is no minimum threshold to meet. However, most of Happy's partners linked the ICD code to the appropriate CPT code, but failed to submit to PQRI ( or not, read below). They failed to circle one of the five 4011-F codes (or not). So most of the quality indicators came in under 80%. Most denominators were in the 5-15 patient range. So you can see, failure to submit just 1,2 or 3 PQRI claims can destroy a whole years worth of effort. And keep you below the 80% threshold. So the question becomes, from a systems standpoint, why are the appropriate PQRI claims not being filed. Are the docs failing to circle the appropriate 4011F code? Are they simply forgetting about it? Quite possibly. Is Medicare screwing up on there end? Are claims being submitted but lost? I wouldn't doubt it for a second. I have heard that Medicare had to hire a whole slew of subcontractors to deal with the flow of paper coming through the PQRI program. I'm sure they are less than perfect. And when you are dealing with small denominators, it doesn't take much to screw you. Is Blue Cross screwing us? I learned today that a plausible scenario involves private insurance as the primary and Medicare as the secondary. When we submit a claim, that would qualify under the PQRI denominator, to the primary private insurance, it is up to to the Blue Cross of the world to forward our PQRI information on to Medicare. I can almost bet you that that will never happen. There is simply no incentive for them to pass it on. When Medicare, as a secondary, gets the bill, they will have patients that qualify in the denominator for PQRI reporting, that will never get reported. That almost certainly will decrease the 80% reporting rate when you are dealing with denominators less than 20. And there is no way to know where the errors are occurring. Medicare does not tell you which patients qualified, which didn't. Which patients you failed to submit but should have. It's a giant black hole of faith. Faith that paper pushers in the entire data trail have done their job correctly, so you doc, get your $600 bonus, the average paid out last year. It's no wonder why less than one third of doctors have chosen to play. So much time and so little money with no way to verify that everyone else is keeping up their end of the bargain. It's no wonder this program is a laughing stock of administrative cost and burden. Unfortunately, since this program will eventually become punitive, like every quality program before us, learning how to master it now will guarantee years of successful average PQRI bonus checks in the future. It will also guarantee a whole generation of jobs in government, jobs that do nothing but push paper from one cubicle to another. But then again, that's what government does best. And imagine, when ICD-10 comes along, this whole process will be 10 times harder. What you'll notice is that our group chose four quality indicators to report on. The rules by the CMS state you only need to report on three indicators 80% of the time. If you do that, they will pay you a (I believe) a 1% bonus on your Medicare charges for the year (in this case six months from July 1-Dec 31 2007). It doesn't matter what I checked, only that I checked something. Notice the not documented; reason not specified. This is CMS quality reporting. This is all a prelude to a cost cutting expedition. The antiplatelet therapy prescribed at discharge for patients diagnosed with stroke or TIA is only good on discharge codes CPT® 99238 and 99239 as well as inpatient consult codes. Since we admit just about every stroke patient, it makes no sense why I can't document this quality indicator on my admission code, but the neurologist can because they are the consultant. If I admit on a night shift and go off service, I can't use that patient as a quality reporting patient. The same goes for the oral antiplatelet therapy for patients with coronary artery disease. We hospitalists can only report it with inpatient consult codes, discharge codes or outpatient rehab or outpatient consult codes. Same situation. If I admit, but don't discharge because I go off service, I can't use this patient as a quality indicator, but the specialist can because they are collecting the consult code. How do I reconcile this process? 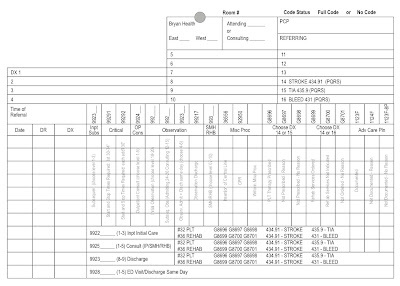 Check to see if the nurses have documented code status or advanced directive plans in the chart (part of admitting nurse documentation). I fill out my card for every person over 65 based on that paper work. If I admit a patient before that work has been done, I indicate it is not documented, reason not specified. And I leave it at that. It is an accurate statement at the time of my evaluation, even if it's not accurate 24 hours later. I check to see if the patient has a history of coronary artery disease OR stroke. If the answer is yes, I make 100% sure that I link that diagnosis with the discharge code on discharge day (if I'm the discharge doc), or the consult code in the rare instance that I consult on these patients. If the patient merely has a history of stroke or coronary artery disease, I make sure appropriate qualifying ICD and CPT® codes are linked together, even if they are admitted for a stubbed toe. Go back and look at the card again to see how complicated the process is. Only certain E&M codes are allowed, and you must link the allowable ICD codes with that E&M code when submitted. If a patient has a history of coronary artery disease but I don't link CAD with my discharge E&M code 99239, that patient won't count for PQRI reporting and. If the patient has CAD and I do use that as an ICD code but don't submit a PQRI for it, I won't achieve my 80% requirement. We Received 2007 PQRI payments of $1,100 from WPS Medicare and $63.00 from Railroad Medicare. According to the report that we pulled from the secured CMS website (IACS), the total amount of $1163.00 is an incentive payment for Dr. Happy. He is the only physician that 'reported satisfactorily'. All other physicians did not earn the incentive as 'insufficient # measures reported at 80%'. In order to receive the incentive you had to report > 80% of eligible patients on at least 3 measures. Dr Happy reported > 80% on 4 measures while the other physicians reported 80% on 1 or 2 measures only. Was it worth the time and effort for our billing company to submit 1000's upon 1000's of PQRI claims only to have me get a small post tax bonus of about $700? I think most groups could answer that with a resounding no. I have no idea how much my billing company charged us to submit all these claims or if they did it for free. I can assure you the whole process in time and resource utilization ran well over $1000. You can see how such a process can be very labor intensive for staff and doctors to document. A thousand bucks is a lot of money, but not when you consider the time I spent and the time of the billing company and the time of Medicare auditors and their paper trail. One needs not wonder why so few physicians participated in the project (15%) of which only half got any money at all. And the average paycheck was $600. I suppose I'm one of the suckers with a $1000 check coming my way. Learning this process early has prepared me well for 2013 when bonus turns into penalty.